Below is a press release about the Methods paper ‘Integrating evolutionary biology with digital arts to quantify ecological constraints on vision-based behaviour‘ taken from the La Trobe University. For the first time, digital animation has been used as a research tool to examine how the effectiveness of a lizard’s territorial display varies across ecological environments and conditions. The new research was published today in the journal Methods in Ecology and Evolution. 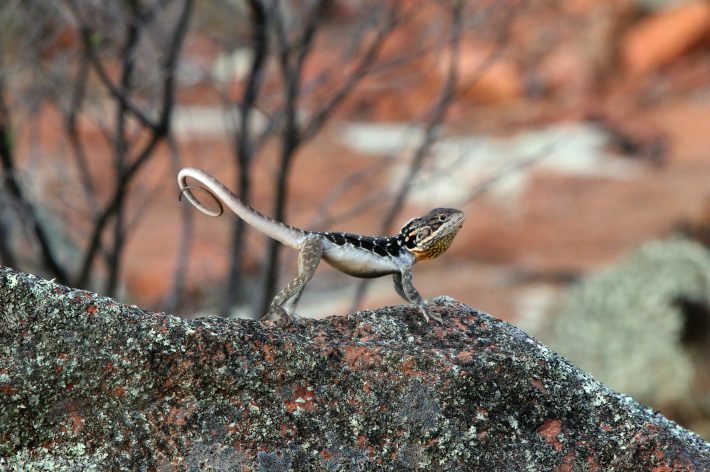 A team from La Trobe University’s School of Life Sciences, led by Dr Richard Peters, worked with academics from Monash University’s Faculty of IT to create, using 3D animation, a series of varied environmental settings and weather conditions, comprising different plant environments and wind conditions, to quantify how lizard displays are affected by this variation. “The use of movement to communicate is common among lizards, but it has been impossible to observe lizard signalling behaviour in every type of ecological setting using traditional methods such as using multiple cameras in the wild,” Dr Peters said. La Trobe University PhD student and lead author, Xue (“Snow”) Bian, explained how a real Jacky dragon (Amphibolurus muricatus) was filmed using a dual camera system. “The lizard’s signalling was reconstructed by digitising the position of multiple body parts through the sequence, subsequently combining the data from the two camera views to reconstruct the signalling motion in 3D,” Ms Bian said. “Then four scenarios were created using the same lizard signal in different plant environments and weather conditions to explore how these different ecological contexts affected signal effectiveness,” explained Dr Tom Chandler from Monash University. Dr Peters said that using animation as a research tool will allow scientists to measure much more accurately the behavioural signals of lizards. “This exciting development in evolutionary biology opens up all sorts of other possibilities for studying animal behaviour in a range of settings, including in environments affected by climate change and habitat modification,” Dr Peters said. To find out more, read the Methods in Ecology and Evolution article ‘Integrating evolutionary biology with digital arts to quantify ecological constraints on vision-based behaviour’ (No Subscription Required for a limited time). This entry was posted in Lab Methods, Methods papers and tagged Animal Behaviour, animal movement, Behavioural Ecology, Digital Animation, Herpetology, Lizards by Chris Grieves. Bookmark the permalink.